More a comedy of manners than compelling romance: Tracey Sinclair reviews Simon Reade’s new stage adaptation of E.M. Forster’s novel. A Room With A View a the Theatre Royal Brighton. Photo: Nobby Clark. Adapting a novel which has already spawned an iconic movie is, one imagines, a tricky business. On the one hand, you have a built in audience; on the other, it’s virtually impossible for any stage production to replicate the scale, polish and (more often than not) big name cast of a cinematic version. This problem feels particularly acute for A Room With A View, a film not only packed with glorious visuals that remain iconic to this day – it’s a rare straight girl who was a teenager in the 80s and didn’t have at least a fleeting fantasy about a lover striding purposefully through a sunlit field of flowers to sweep her into a kiss, which is a hard dream to hold onto when you’re a tubby indie kid on a Northern industrial housing estate, I can tell you – but also boasting a cast who have only become more famous since it was made. So through no fault of the production itself, I spent much of the opening scenes of this play jarred by the fact that I felt I should be watching Maggie Smith, Judi Dench and Helena Bonham Carter, and a bit disappointed that I wasn’t. But taken on its own merits, Simon Reade’s adaptation is an enjoyable distraction, albeit a more convincing comedy of manners than compelling romance: Lauren Coe’s Lucy is plucky and likeable, with backbone enough to root for, but she and George (Tom Morley) have little chemistry (though this does warm up towards the end, so the denouement, at least, is satisfying and pleasingly optimistic.) The able cast do best when skewering English social pretensions – the novelist Miss Lavish’s (Joanne Pearce) self-satisfaction at not being a typically English visitor, when her view of the Italians is actually as reductive and blinkered as the most sheltered of tourists; the Reverend Eager’s (David Killick) empty moralising. But in this rather bloodless production, sincerity fares less well, so the Emersons suffer slightly: George at times seems positively odd in his abruptness, while his father (a sympathetic Jeff Rawle) too often seems simply an unrealistic fool. This makes the first half smoother than the slightly choppy, overlong second half, though that is enlivened both by Charlie Anson’s splendidly stuffy Cecil and the famous male bathing scene, which garnered so many shocked, delighted titters from the audience that for a moment it was possible to believe we were transported to Edwardian times, not stuck in the jaded 21st century. The second half was also slightly frustrating in that Paul Wills’ elegant set, while nicely capturing both the English and Italian settings, could have been better checked for sightlines, since characters were regularly obscured by the scenery. 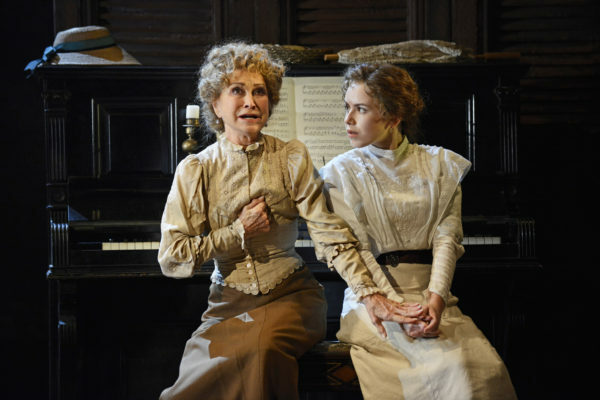 The production clearly recognises it can’t match the stellar power of the film, but has the sense to at least offer us A Genuine British Institution, and Felicity Kendal is a delight as Charlotte Bartlett – fussy, flapping, and overly concerned with trivial niceties, but with satisfying glimpses of both an underlying slyness and a turbulent past, and a sincere desire to see Lucy achieve the kind of happiness she herself has forfeited. But such depth of character is rare: overall, this feels like E.M. Forster done as Oscar Wilde. Director Adrian Noble may be skilled at capturing the minutiae of the drawing room, but he fails to imbue the story with any real sense of idealism, passion or romance: this is not a piece to lose your heart to.